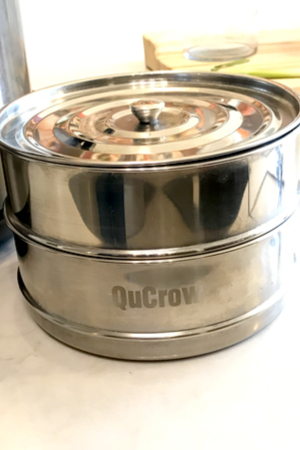 I remember when I got my first Instant Pot – the 6 quart Duo. I was thrilled and ready to dive in to make anything I could, and chicken and rice was on top of my list. Instant Pot Chicken and Rice – all made at the same time. But then things changed when I began reading all of the Facebook posts. My enthusiasm took a back seat. Among all of the delicious recipes that people post, I found huge discrepancies in recipes. Especially in the amount of time required for cooking. Not to mention that the cooking method may be totally different for the exact same recipe. For example, hard-boiled eggs in the Instant Pot come out amazing. There is no boiling pot to watch and they are very easy to peel. However, if you ask 5 different Instant Pot owners on how they do it, you will likely get 5 different answers. Of course there are variances in every recipe. Some people like their hard-boiled eggs completely solid in the middle, and others like the yolk a little softer. Some people steam cook them while others use the pressure cook button. The cook time can range from 2 minutes to 7 minutes. And of course, some let the pot naturally release and others perform a quick release of the pressure. Now you know why I was so confused! And you may be feeling the same way. So let’s start out with cooking chicken. To keep things simple, I am talking about boneless, skinless, chicken breast. It is best to use frozen thin chicken breasts for this recipe. If you go to your grocery store, you are going to find all different sizes of chicken breasts. The organic, grass-fed ones are typically smaller and thinner than the large factory birds. Then there are chicken breast tenderloins which are super thin. So when we set out to make Instant Pot Chicken and Rice, we have to clarify what size chicken breasts to use. When we purchase a bulk package of fresh chicken breasts from the grocery there are two things that we do. First, we figure out how many we will need for the next few days for our anticipated recipes and set them aside. Secondly, we will prepare the other breasts to be frozen. With the large thick ones, we will cut them in half horizontally which leaves two thin breasts. We will then place them in individual freezer safe bags. That way whenever we need a single frozen chicken breast, we aren’t risking our lives trying to prior them apart with a sharp knife. 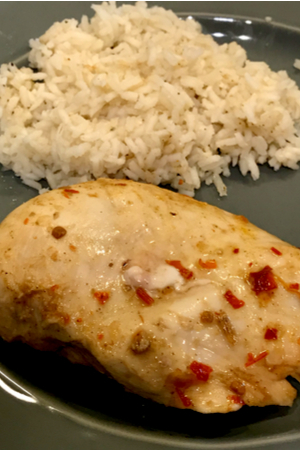 In order for the chicken to cook at the same time as the rice, it is best to use thin chicken breasts for our Instant Pot Chicken and Rice recipe. You can buy a bag of frozen chicken breasts in the grocery store. Just be sure to use the thin ones for this recipe. Ever since making my first batch of rice in the Instant Pot, I have always preferred to use the pot in pot method. Chicken broth adds more flavor to the rice. This prevents any chance of the rice sticking to the stainless steel liner. And less sticking = less clean up! For this recipe I used long grain instant white rice. However you could also use Basmati or Jasmine rice as well. 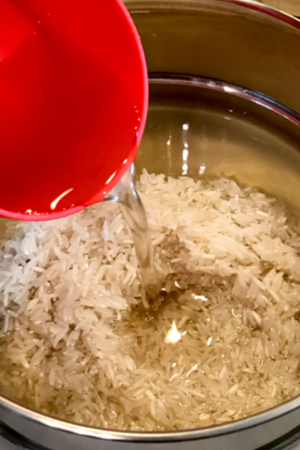 When making rice all by itself, I will use a 1:1 ratio of chicken stock to the rinsed and drained rice. However, because we are using the stackable inserts for this recipe, we increase the stock to 1 1/3 cups. The reason behind this increase is that the top stackable insert cooks at a slower pace than the bottom pot. And because we are increasing the cook time, there needs to be more liquid for the rice to absorb. As mentioned, we used stackable inserts for the pot in pot method for our Instant Pot Chicken and Rice recipe. The chicken is in the bottom pan and the rice is in the top. These inserts allow you to cook multiple items at the same time. One trick to remember when using them, whatever requires a longer cooking time needs to go in the bottom insert. In this case, it is the chicken. The bottom insert contents are closer to the actual heat source and will cook at a faster rate than the top. After the cooking time expires, allow the pot to naturally release the built up pressure for at least 10 minutes. 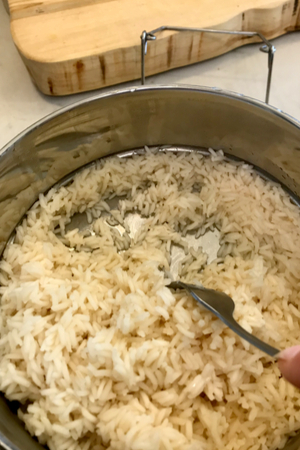 The rice is cooked perfectly and can easily be fluffed with a fork. That is what makes this Instant Pot Chicken and Rice recipe a perfect fit for the stackable inserts! 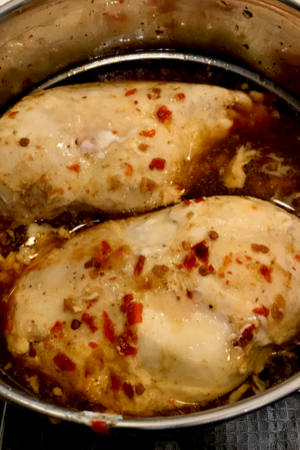 Frozen chicken breasts cooked and ready to be served. A classic recipe of chicken and rice made in the Instant Pot using the pot in pot method. A delicious dump and forget meal. Place your frozen chicken breasts, in a single layer,in the bottom insert of your stackable container. Add whatever seasoning/marinade that you like. 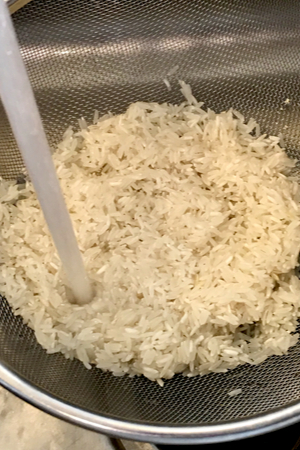 Rinse and drain 1 cup of white rice in a fine mesh colander. Add rice to the top insert of the stackable container. Pour 1 cup of chicken broth in with the rice and stir. Add a pinch of salt and 2-3 drops of extra virgin olive oil in with the rice and stir. Place the lid on the top container and use the carrying trivet to secure the top and bottom inserts together. Add 1 cup of water to the liner of the insert. 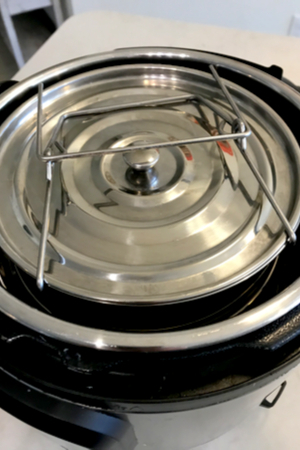 Place the stackable containers along with the carrying trivet into the Instant Pot. Close the lid and place valve in the sealing position. Pressure Cook/Manual on HIGH for 20 minutes. Carefully remove the stackable inserts. Remove the lid and fluff the rice with a fork. Cut or shred your chicken and season with salt & pepper as desired. 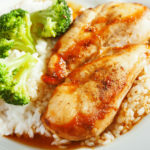 Serve chicken on top of or beside the rice. This recipe was tested in a 6 quart pressure cooker and it took 9 minutes to come to pressure. 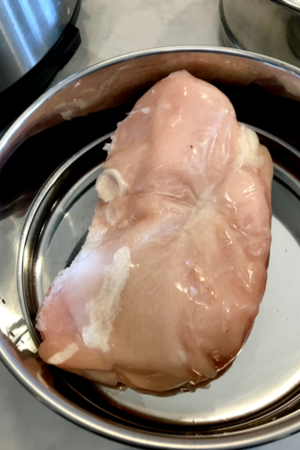 Cooking times can vary upon the thickness of your frozen chicken breasts. Test temperature prior to eating to make sure the chicken is cooked in the middle - USDA recommends internal temperature of 165°F.